Daina Ringus and Matt Stasiewicz describe key factors in cheese and beer making. On Friday, February 18, 2011,the Cheese Club at Cornell and the SHA/CIA Alliance sponsored an all American cheese and beer pairing, featuring six unique cheeses and beers, as well as locally made traditional breads. In addition, Stefan Senders, of Wide Awake Bakery, brought samples of the different styles of bread he produces and talked about the key characteristics of each. Wide Awake Bakery produces French country boules, Italian Ciabatta and Pugilese, German Vollkornbrot. All of Stefan’s grain come from local farms and is milled locally. Stefan has recently finished the construction of a rotating commercial size hearth oven where he does all the production for his bakery. 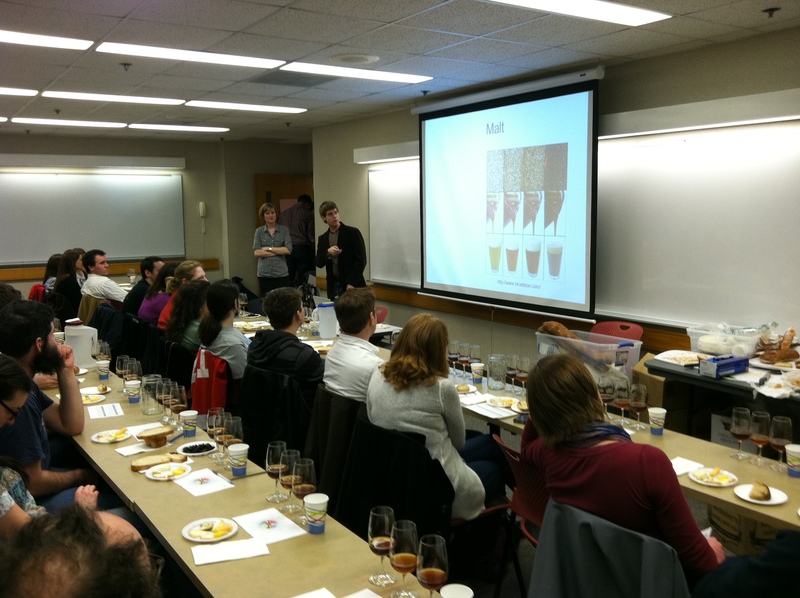 The pairing and discussion of the production process for the various cheeses and beers was led by Daina Ringus and Matt Stasiewicz, both graduate students in CALS Food Science.